What types of food do you not like to eat? How often do you go out for a meal? On what days of the week do you usually eat out? Which meal(s) (breakfast, lunch, dinner) do you eat outside of your home? How much do you spend on a typical meal? Do you go out alone, as a couple, or in groups? 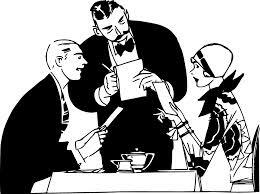 What are your main criteria in choosing a restaurant? What are your main reasons for not going out to eat? What is your primary means of transportation?